We teach a combination of classical and neoclassical styles, highlighting the Vaganova and Cecchetti methods in order to provide our students with a well rounded dance education that can prepare them for any future in ballet. Ballet without the grand allegro! This class is focused on gentle body conditioning, strengthening and relaxation. There is a special focus on opening the hips and strengthening the back and pelvis. Wear your baby to ballet class! We highly recommend using an ergonomic secure front pack to take unnecessary pressure from unbalanced weight distribution off your knees.This class is focused gentle conditioning, toning and coordination for moms and music and movement to soothe and stimulate babies. This is class is designed to be a fun and exciting introduction to creative movement and musicality. This class is designed for each child to be accompanied by a parent or guardian. 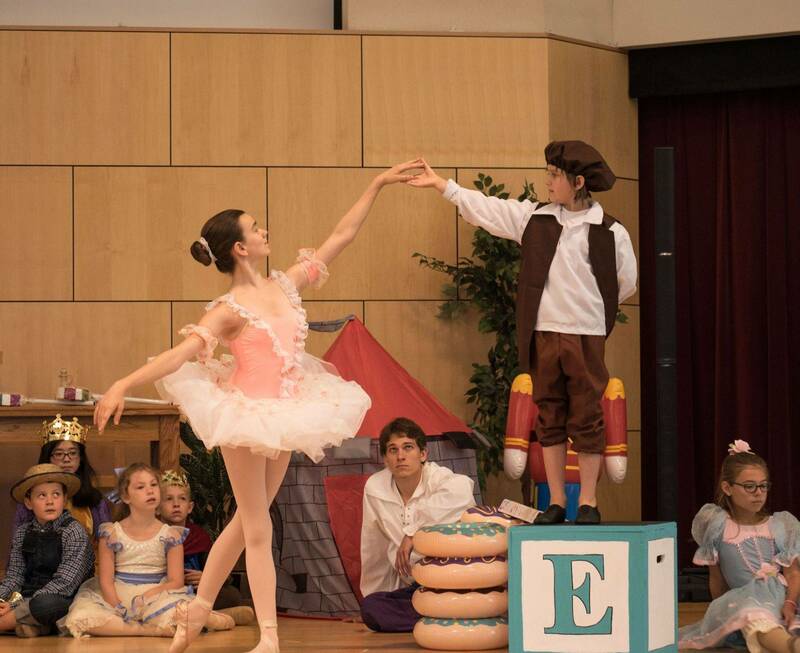 An exciting introduction into the world of classical ballet! Students learn basic ballet techniques, positions and terms. Each week we read a story or part of a story before our choreography component of class to aid in creative expression and the aspect of performance. All dance tells a story! An energetic and fun introduction to both ballet and tap in one class! Parents: please be sure your child's tap shoes have elastic (instead of ties) to make the shoe change take place as quickly as possible. Due to the advanced skill levels taught in this class, classes are 90 minutes, unless combined with Intermediate Ballet, where classes are 60 minutes. This class is designed for the serious ballet student as means to build and perfect technique and endurance. Students must also be enrolled in a additional ballet and additional pointe class. It is never too late to learn ballet. Part of classical ballet technique that concerns pointe work, in which a ballet dancer supports all body weight on the tips of fully extended feet. Pointe work is performed while wearing pointe shoes, which employ structural reinforcing to distribute the dancer's weight load throughout the foot, thus reducing the load on the toes enough to enable the dancer to support all body weight on fully vertical feet. All pointe students are required to take at least one ballet and one technique class. This class focuses on strength, balance and technique exercises for students wanting to go on pointe or students already on pointe. Students are encouraged to enroll in Stretching & Conditioning or Pointe Fundamentals. Students must be enrolled in a ballet class. Every ballerina aspires to dance en pointe beautifully. In this class you will learn how. Students must be approved for this class either by "graduating" from Pointe Fundamentals or by audition. Students must also be enrolled in a ballet class.